Topaz film offers superior "black on white" images while at the same time allowing high speed diazo reproductions. 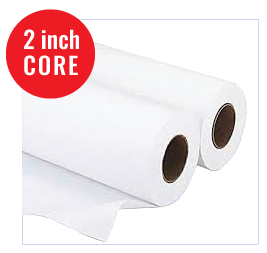 Fast drying times combined with unparalleled line uniformity and density make this film the choice for inkjet plotting. Exceptional surface characteristics allow for clean moist erasing without losing the matte surface... making numerous manual redraw options possible. The inkjet coating on one side allows excellent pen plotting on the opposite side. If you are looking for an archival media, Topaz Double Matte film offers both durability and dimensional stability. The coating even minimizes ink wash-off due to surface contact with water. Mylar: 3 mil Double Matte RollsTopaz jet media is custom-designed to meet the needs of architects, engineers, designers, and blueprinters who use Computer-Aided Design (CAD) applications and large-format ink jet printers. Mylar: Double Matte 4 Mil Film RollsFast drying times combined with unparalleled line uniformity and density make this film the choice for inkjet plotting. Exceptional surface characteristics allow for clean moist erasing without losing the matte surface.